Spire’s Price Matrix allows the user to set pricing for customers and groups of customers in many different ways. Save – Saves the price. Save & Close – Saves and closes the price. Copy – Copies a price record. Whse – Warehouse for the price. If this is left blank then the price applies to all warehouses. Part No – The item getting the price. Unit of Measure – The UOM of the item getting the price. Product Code – Used if applying the price to a product code. Can only be used if Part No is blank. Customer – The customer getting the price. Ship To – Use this if the price is restricted to only one of the customer’s Ship To’s. Territory – Use this if the price applies to a complete territory. Type – Select a ‘Type’ from the lookup list if the price is for a group of customers. Each customer would then get assigned to that group in customer edit/General/Type. Date Range – The starting and ending dates for this price. Many ranges can be added as long as they do not overlap. 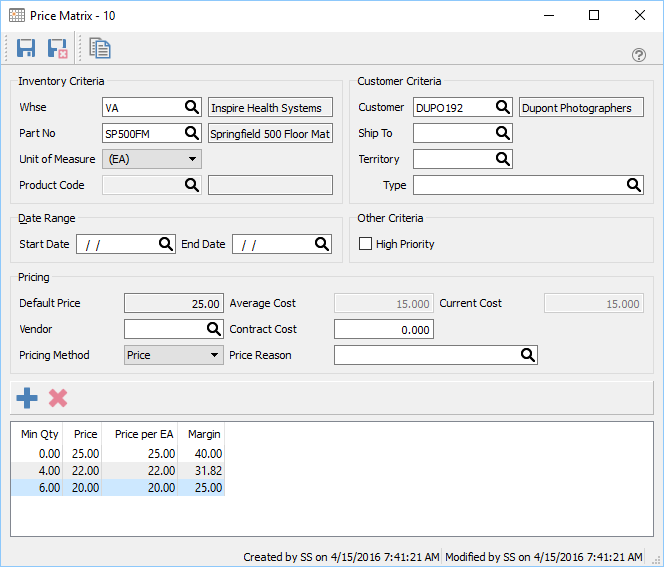 If a sales order is created for a past date, and a price matrix record exists for that date the order will be given this price. Default Price – The price the customer would get if they did not get this special price. It comes from the level that the customer is set for and this is the price that price matrix discounts would be based on. Vendor – If there is a GL account in Company Settings/General Ledger/Differential GL Account then a vendor can be added and a contract cost added below. Price – A set price for this item. Discount – A discount off of ‘Default Price’ as described above. Average Cost – The average cost from inventory. Contract Cost – The cost that will be applied when selling to this customer. If this cost is different than the average cost, the difference will be posted to the GL account set in Company Settings/General Ledger/Differential GL Account. This is usually a vendor rebate account. This way when selling an item that has a contract cost the inventory GL account is still credited by the average cost. Price Reason – The reason this price is being offered. It could be a contract number of something like ‘FLYER’. This reason will appear on the sales order detail line. Current Cost – The current cost from Inventory. Add – Add a price, discount or margin. Delete – Deletes a price. Min Qty – Adds a quantity if the price has a minimum quantity. Price – The Price, Discount or Margin amount. Price per X – If an item and warehouse has been selected then a unit of measure can also be selected for this price. Margin – The margin that this item will obtain based on this price. Only shows is item and warehouse are selected. This list can be filtered and exported if mass updates need to be done using the Spire import routine. Be sure to include the record number if the import should replace the prices that are already there. If it is not included and a price already exists then the user will get a duplicate error on import. Store All Price – This will save the edited prices to the customers price matrix file. 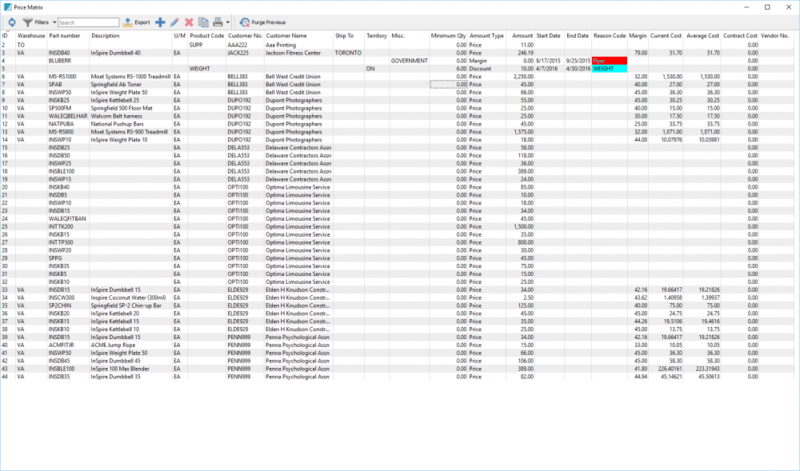 Store Selected prices – This will store all prices from this sales order to the customers price matrix file. Once clicked the user will be given these options. Create Records for regular prices – Even if the price is note edited this will add a record to the customers price matrix file. They will get regular price for this item. However if the regular price changes they will still continue to get this stored price unless the user also updates it. Apply to all Warehouses – Apply the price to all warehouses. This way the customer gets the same price even if they go to another location. 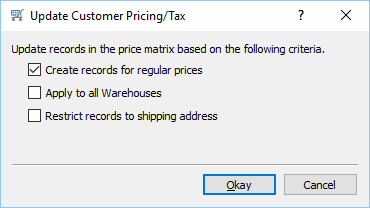 Restrict records to shipping address – If selected then only the ship to on this sales order gets this added to their price matrix file. If not selected then the billing and all ship to addresses get this price. If a ship to is not on the order then it is grayed out. Once added and saved the user can view or edit them on the list.